Enabling and Disabling Window Widgets? Is there anyway (that works) to enable or disable specific window widgets? I've tried using the window flags to set the enable and disable specific flags for specific window widgets to prevent resizing and or maximizing a window, but it doesn't work and the widgets are still enabled. I'm using Qt 5.11 on an iMAC running iOS Mojave. Having just searched around for alternate solutions, I haven't tried but will when I get back to my system...getting the widget and then calling setEnabled(true/false) directly instead of using the window flags (setWindowFlags). Can you provide a minimal compilable example that shows what you are trying to do ? I'll try tonight when I have access to my system...it isn't difficult to replicate, presently I'm modifying the window flags to disable window widgets, but it doesn't seem to work. the flag is obviously for Windows only, I'm unsure what the equivalent is for MacOS. This however should prevent the user from resizing the the (standalone) window without removing the buttons or borders all together. This is what I think you're trying to do. Correct my if I'm wrong. Thank you, I am looking for a method of programmatically enabling and disabling any of the widgets (close/minimize/maximize/context help/title/system menu). Also the solution needs to be compatible with Windows, Linux and iOS. In the above example pobjCtrl will be a pointer to the window widget. This works for the minimise widget, it doesn't work for the close and maximise / restore widgets. I would have expected that since flags exist for these to work, they don't. This won't solve my problem as the method is part of QStatusBar, my window doesn't have a status bar and shouldn't need it to disable sizing. QWindow has a method called setFlags, is this the same as calling the setWindowFlags on the widget? @J.Hilk, Just reading your post again, yes your solution is for windows only. How do I do this for Windows, iOS and Linux, I would have thought this would be handled by Qt. @SGaist, is the code I've posted sufficient? Didn't work widget still accessible. No it's not, it doesn't allow anybody to easily reproduce what you are doing. on your platform(s) and see what the combinations gives/shows. @mrjj , Thank you, I'll try this tonight, 7:40 am now, I'm not back at my system until 18:00 tonight. @mrjj, I downloaded all the files and built the demo, just to recap, the version of OSX I'm running on my macBook Pro is High Sierra version 10.13.6. The version of Qt is 5.11.2 (Clang 8.0 (Apple) 64 bit). I would love to say the application worked and has solved all my problems, I was planning to debug it and then replicate how it works, sadly its no better than my code. Radio buttons, Window selected and Preview child window displayed. Overall very disappointing it seems that most of the hints have no effect at all, surely this is a bug that needs attention ? Just to be sure we are on the same page: are you trying to develop a desktop like application for iOS ? @SGaist, I'm trying to develop a desktop application that ultimately can be run on any OS supported by Qt, including Windows, iOS and Linux. You have to take into account that iOS and Android don't offer the same kind of window management as the desktop OSs and that's nothing Qt can do about. For example, on mobile OSs you usually have one full screen application where you can have some dialogs but it's not comparable to what Linux, macOS or others have for you through e.g. Xorg or wayland. I accept what you are saying with respect to Android and iOS, but the isn't one of those. Sorry should have mentioned it. The samples are directly available in Creator with a normal install. Sadly i cant help testing as i have no access to any Macs. The point is Qt is supposed to be multi-platform, I don't have a Windows PC or Linux, only Mac's and clearly it doesn't appear to work. Well not all hints are supported on all platforms. Note the MS in front. 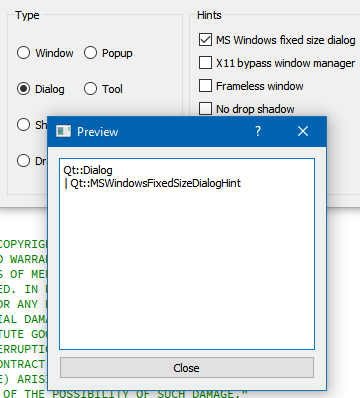 The MSWindowsFixedSizeDialogHint do work on Windows. Sorry, for a product as mature as Qt this isn't what I would expect, I know this kind of thing is perfectly possible, just Qt doesn't currently work correctly. Well it depends on platform and the Windows manger in use. Some combinations are not possible in Windows either. Also some windows mangers on linux also ignore certain Hints. You are aware that Qt does not draw the decorations by its self ? and Qt would have to resort to custom drawn decorations. The fact that it can be done using Xcode means its very possible go do, if Qt didn't rush out quite so many versions, the quality control would be better and the releases more functional. I'm a big fan of Qt and have used licensed versions of Qt for defence applications, licenses are not cheap and considering the money involved i would be a seriously disappointed by this show stopping lack of functionality. In less than 2 years I've seen Qt go from 5.1 to 5.11 and still going, releases seem to come out very frequently, which is good in one sense but at what cost? Qt 5.1 was released 5 years ago in 2013. @SGaist , ok, still a lot of releases in a short space of time, the functionality I'm trying to use is very fundamental...shouldn't that be addressed? @SPlatten As @mrjj said window decorations (including the close/minimize buttons) are NOT handled by Qt. Those are handled by the OS. And different OSs are different here (even different window managers on Linux differ here). You can still do this using native APIs. If you think this should be part of Qt you can file a change request. @jsulm, thank you, how do I submit a change request? @jsulm , if you can see my first posts I am OR'g in Qt::CustomizeWindowHint with each bit. I will try the WindowFlags example as I cannot guarantee that I did the same when testing with that. There is sum good news and some strange findings, I am running the WindowsFlags example on my macBook Pro. The setup is as follows, from the Type radio buttons, the Window is checked. From the Hints checkboxes, Customize Window is checked. With no other checkboxes the window appears with no title and no widgets, it isn't resizable. With 'Window minimize button' checked, the title is visible and only the minimize widget is visible. If I then enable 'Window maximise button', the maximise widget is enabled along with the minimise widget. Toggling 'Window Title', 'Frameless window', or 'Window shade button' have no effect.